More excellent work, love them! 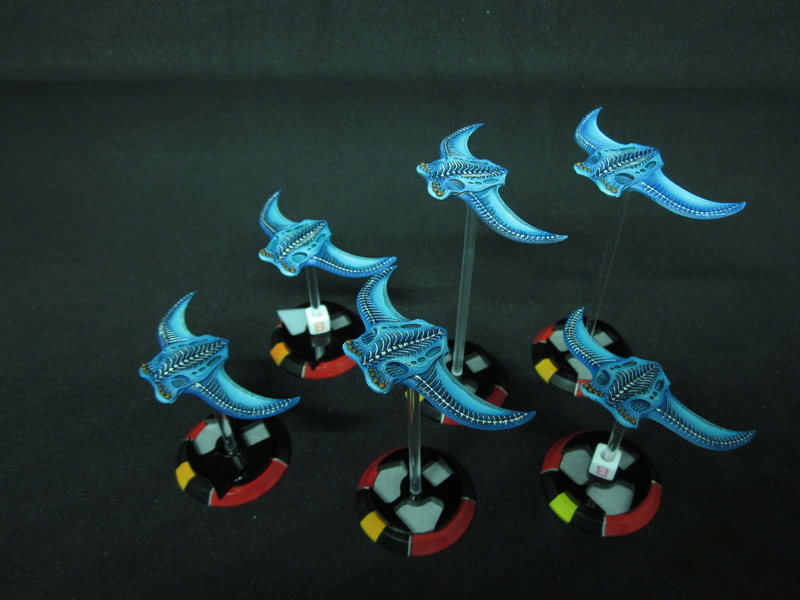 Great job on these Scourge! Abrusio I have been staring at the Nostromo and your fleet for months, but I'm not quite sure how to replicate the colour scheme. Any chance you could write up a quick tutorial? Vallejo model air US light grey, undershading with Vallejo model air Medium Sea grey. Highlights with vallejo model air white. Vallejo metal colors : base color with exhaust manifold, highlights with silver, extreme highlights with aluminium. Wash with citadel nuln oil gloss. The metal colors are in my opinion the best acrylics metallics on the market, even if they are expensive. You only need a couple bottles anyway (aluminium is not necessary at all). 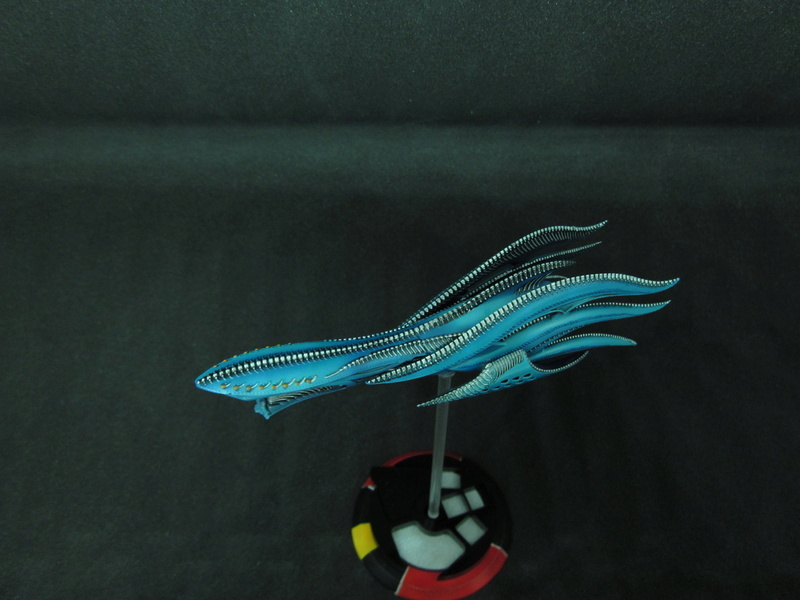 Most of the work is done with an airbrush. 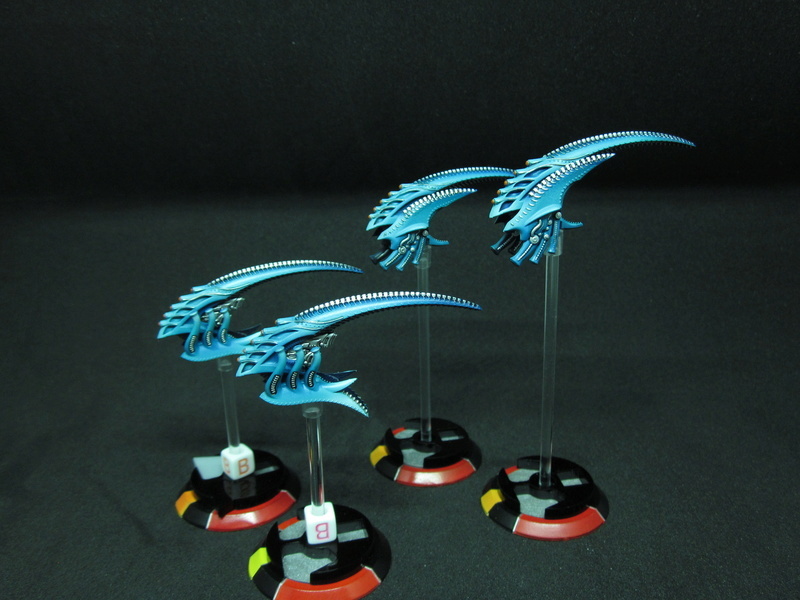 You will need precision to do the panel lines preshading. 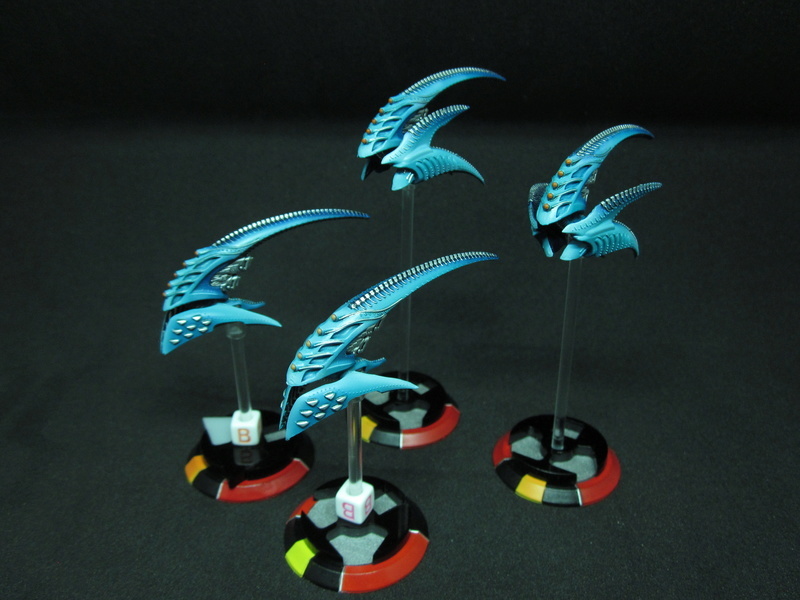 The turrets were magnetized, so it is easier to paint them separately, using the same colors. Prime the model black (I use vallejo black polyurethane primer). Do a zenital with grey (45° all around, focusing on the wings and on the top) and then with white at about 90°. The trick then is to do the colors in the right order if you can’t paint in subassembly (like I could with the cruisers). First, the red, as it is the easiest color. Gory red and black red on the underside, gory red and blood red on the top, just put the darker color in the recesses and the brighter red on the parts that would catch the most light. That’s the hardest part : white is always tricky and also you don’t want to overspray the white or greys on the red. I had a lot of overspray and had to go back to the red, and redo the white several times. It should be possible to do it in one pass with masking (with masking tape, blue tac or just a paper shield) but I was overconfident in my ability to do it without. This is done with medium sea grey. Low pressure, good dilution and good trigger skills are required to get all the lines clean. But you can always come back with white to correct mistakes. Once the preshading is done, spray US light grey on it. It should be diluted to be a glaze, to allow the preshading to show through it. Highlight the pannel center with white with care (you don’t want to have to redo all the preshading again). 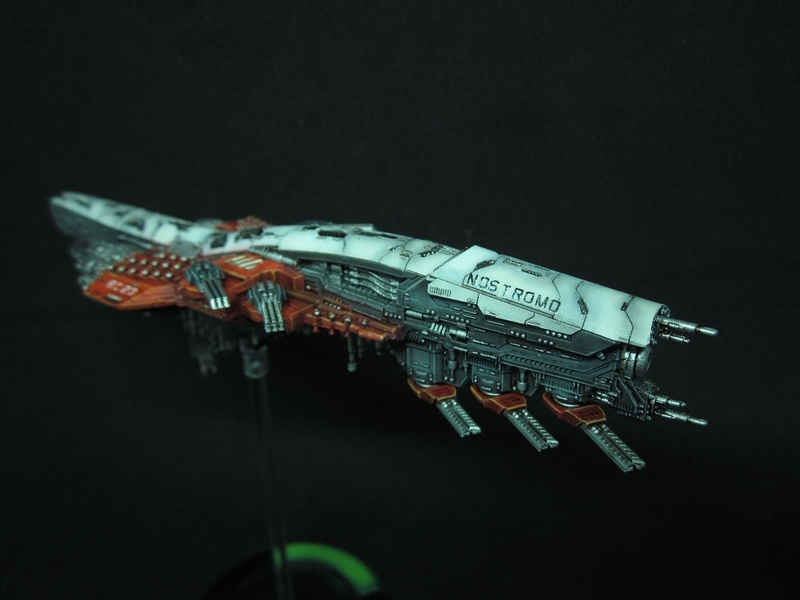 Once the upper hull is done, if the reds are not ruined, you are almost done (with base colors). 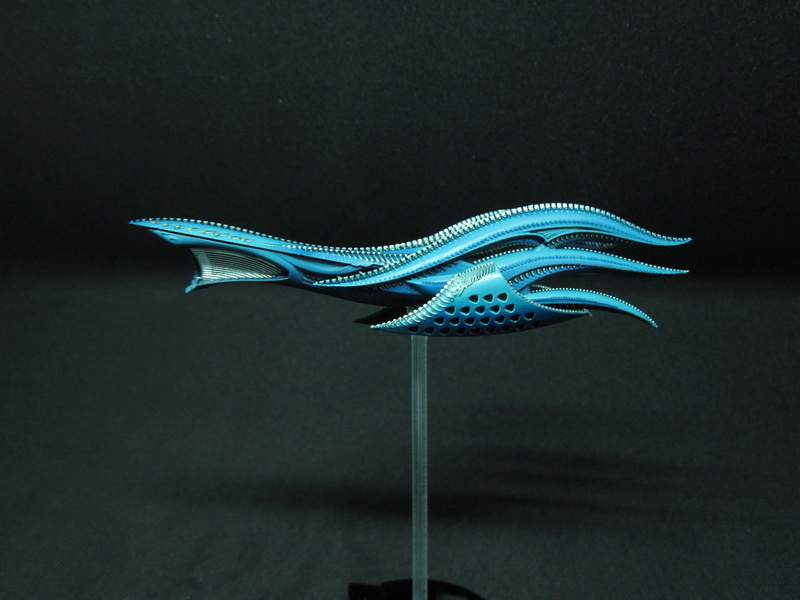 With a brush, paint all the lower hull parts with dark blue grey. You want the paint to be thin, even if you have to do two or three passes, but if its a new bottle it can almost be used right away without thinning it much. Of course you don’t want to touch the reds or the whites with it. Once the base color is done, do the highlights with a mix of dark blue grey and Pale blue grey, about 50/50. Once again you don’t want to touch the reds or the whites with it. Paint all the metallic parts with Exhaust manifold. It is a wonderful dark metallic color with excellent coverage. If you want a perfect finish (not required in my opinion) you could first paint every metallic part with a glossy black first (it is recommended by the manufacturer). Do the highlights with Silver. I can be runny, so get rid of the excess with a towel before applying the brush to the model. Once it is done, you can wash the metallics with nuln oil gloss. The glossy version of nuln oil works perfectly well on metallics (it is done for them after all) and you can just brush it without worrying too much, just don’t let it pool, get rid of the excess with a brush. Nuln oil gloss also works really well on the non metallics colors. It flows better than the regular nuln oil, which is perfect when applying it on a glossy surface like we have after our gloss varnish. You have to do a pin wash : get the wash just in the panel lines and nowhere else or you will have staining. Just wash the whole thing with nuln oil gloss, and remove the excess where it pools. It will shade the greys and blend the colors. Edge highlights with the yellow-orange mix. Apply a tiny dot of aluminium on the extreme points of light where it would get the metal shine the most. Come back with a brush with gloss varnish to redo the metallics. - It is possible to correct a mistake with a wet cotton bud or a wet brush if applied right away. It won’t alway works but it can save time. - Wear a glove on the hand that is holding the model, it will protect the paint from the skin oils that could ruin your work. Airbrush paint is really thin, and therefore fragile. - For the same reason, use a couple blister foam to place the model between painting sessions, it is better than letting it stay on a hard surface. It can prevent the paint from chipping. Mate you should be a piece of world heritage.